JTEKT's Cairo facilty is the winner of Georgia's Automotive Supplier of the Year Award. The award recognizes a supplier to an automotive OEM, at any tier, that demonstrates strong growth and projections, which positively impact the overall economic health of the state of Georgia. This award is one of five the Georgia Department of Economic Development (GDEcD) presented at the third annual Georgia Automotive Awards ceremony earlier this month. The awards are designed to recognize automotive leaders throughout the state, and to honor them for the contributions they have made to build a robust automotive ecosystem in Georgia. 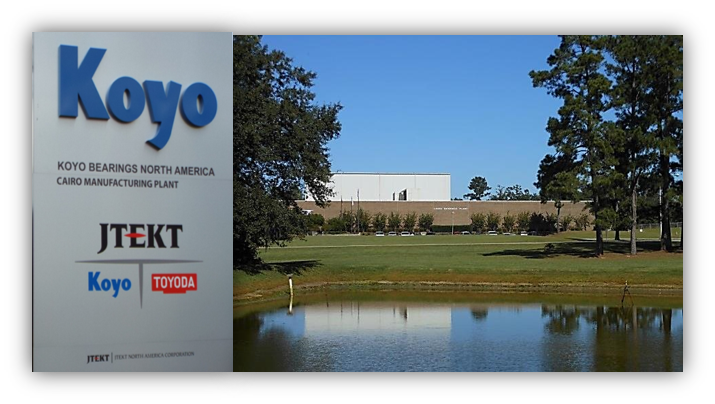 JTEKT North America’s Koyo Bearing plant in Cairo manufactures high-volume automotive components utilized in engine valve train and transmission applications. The Cairo facility employs more than 400 associates in and around Grady County who produce upwards of 90 million high-quality bearings annually for global customers in the automotive and industrial segments. Since 2014, JTEKT has invested nearly $30 million in the Cairo facility, installing the latest bearings equipment and technologies to continue to produce world-class products and attract the next generation of associates. With additional manufacturing facilities in Dahlonega and Sylvania, JTEKT employs nearly 1100 Georgians who manufacture products for the aerospace, industrial and automotive industries. Nominees in each of the five categories were voted on by representatives from the Georgia Automotive Manufacturing Association, Georgia Tech, Georgia Economic Developers Association and others. These committee members embody a diverse cross-section of experts with a deep understanding of the automotive industry.